The Van Allen radiation belts that encircle the Earth were among the earliest discoveries of the Space Age, but many of the mechanisms that create them and govern how they function remained mysterious until only recently. Two tough NASA spacecraft – the Van Allen Probes – have spent the past two years living within these hazardous regions of near-Earth space, and they have helped researchers understand a great deal about the belts and the fundamental processes that drive the particles within them. Beyond those findings, the mission has unveiled new real-time visualization tools that, for the first time, use data from the spacecraft to provide an easy-to-understand view of the space weather above Earth just minutes after the data was taken. Two years after their launch from the Cape Canaveral Air Force Station in Florida on August 30, 2012, the Van Allen Probes have delivered a wealth of data that has resulted in numerous discoveries, findings, and papers, all of which have increased our understanding of these fascinating regions of space. The mission was declared a success on March 26, having accomplished and exceeded its primary scientific requirements just one and half years into its two-year primary mission. Since then, the discoveries have continued, including a recent finding which addressed one of the major questions about the belts: How are the particles within them accelerated to nearly the speed of light? Data from the probes helped prove that a “one-two punch” mechanism of electric and magnetic fields within the heart of the radiation belts themselves can cause the high-speed acceleration. While it was anticipated that the Van Allen Probes would resolve a number of quantitative questions about the formation of the radiation belts as they indeed have, one of the truly surprising aspects of the findings is that after 50 years of radiation belt studies since their detection in the late 1950’s, new structures within the radiation belts have been revealed that have not been previously documented. Among these structural discoveries are the formation and persistence of a third belt, called a storage ring, and a pattern referred to as “zebra stripes,” caused by Earth’s rotation. In addition to the fundamental scientific knowledge that the Van Allen Probes are providing, the mission is also delivering a wealth of practical information. Some of this will be useful for the design of future spacecraft and their operation in the radiation belts, an area of space that, when very active, can cause severe damage to satellite systems and can harm astronauts. The data collected by the probes will help guide new models and baselines for the effects of radiation on spacecraft and systems. One of the particular areas of study for mission researchers is Earth’s space weather, which is the effect of the sun and other space environment elements on the region just above our atmosphere. Space weather data, a subset of the full science data, is broadcast in real-time and currently received by two foreign partner ground stations, one in the Czech Republic and one in South Korea. The data is automatically received and made available for processing whenever one of these two stations can establish a communications link. Earlier this year, the Van Allen team unveiled a new series of data visualization tools that translate the raw space weather information from the twin spacecrafts’ instrument suites into understandable images and animations. While many of these are designed for researchers and space scientists, some of the data most useful to the general public – information about space weather above Earth – is now presented in dynamic new ways. These new tools compile basic space weather data from the spacecraft into a model showing the orbits of the twin probes and the Earth, along with a colorful spectral plot of the current state of space weather above the planet. For any selected range of data and time, a PDF or graphics file can be generated, “and there’s even a QR [quick response] code generator, which is useful for presentations and posters,” said Barnes. NASA launched the twin Van Allen probes in the summer of 2012. APL built and operates the probes for NASA’s Science Mission Directorate in Washington. 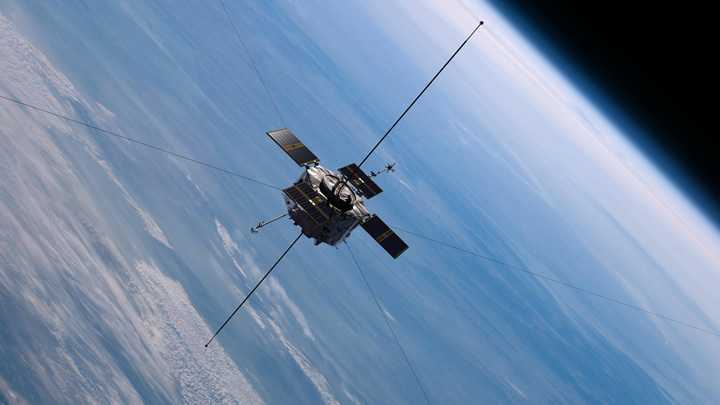 The Van Allen Probes are the second mission in NASA’s Living With a Star program, managed by NASA’s Goddard Space Flight Center in Greenbelt, MD. The program explores aspects of the connected sun-Earth system that directly affect life and society.